GRW is a leading South Africa based transport equipment designer, manufacturer, and service provider of a wide range of sophisticated, cutting-edge tankers and trailers. 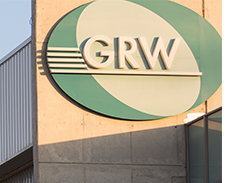 Founded in 1996, GRW’s hub is its Worcester manufacturing complex. Highly qualified engineers employ the finest technologies and procedures in the extensive ultramodern production facilities to produce world-class and ever reliable trailers. Each being configured to meet the unique transportation needs of customers. Industries served range from construction and mining to petroleum and chemical; fast-moving consumer goods to perishable temperature-controlled goods; palletised goods to break-bulk general cargo. GRW is committed to enhancing the productivity of its customers – operators across Southern Africa, the Middle East, Australia, Europe and the United Kingdom – well beyond the production line. GRW owned Service Centres in Cape Town, Gauteng and Durban provide first-rate contract servicing, minor repairs, roadside assistance, modifications, accident repairs, and a wide range of spares and rental units, all in accord with the latest global industry developments and standards. Supported by a network of independent repairers, and by maintenance agreements with OEMs, a broad, 24-hour aftersales support network to customers is guaranteed.